Create a delicious meal with this Classic covered saute pan from Scanpan. 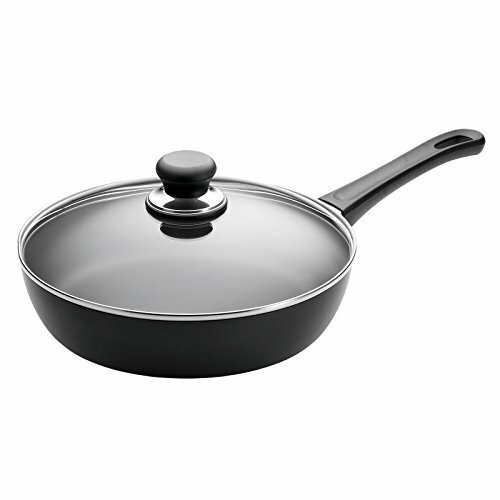 Made of heavy-duty, pressure-cast aluminum, this pan ensures quick, even heating with no hot spots. With ceramic-titanium nonstick technology, food is never left behind in the interior of the pan. The patented spring-lock handle stays cool during stovetop use. It includes a glass lid for easy monitoring of the cooking process. Oven safe to 500 degrees Fahrenheit and backed by a manufacturer's lifetime warranty, this saute pan also dishwasher safe for easy cleanup.